Radon is a radioactive gas that occurs naturally. It has no taste, smell or colour and special devices are needed to detect it. Radon is everywhere, usually at levels that pose negligible risk, however, in areas where concentrations are high, it does pose a risk to health. Exposure can cause damage to lung tissues and studies around the world have linked this to lung cancer in extreme cases. The map shows the affected areas in England and Wales. If you are thinking of buying a house in an affected area this may seem alarming, however, in affected houses the problem can usually be tackled with simple, effective and relatively inexpensive measures. Radon is just one of many factors to consider when buying a house. If you come across a property that suits you but has a radon problem, the radon problem can be treated to make it a house which you are happy to occupy. Even in areas affected by radon, most homes do not exceed the action level. The action level has been set by the government at 200 Bq/m³ (becquerels per cubic metre). Air rises from the soil and enters buildings through gaps or cracks in the walls or floors. If the building is in an area where radon levels in the soil are high, the indoor radon level can exceed the action level. 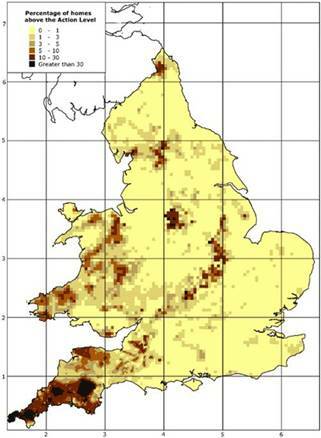 The government offers a radon risk report for £3.90, which will tell you if your home is is an affected area, or a monitoring test for around £50 for a single property (current as at Sept 15). The test is conducted by post and consists of placing two plastic spectacle lenses in a protective shell in the living room and an occupied bedroom. After three months, they are returned to a laboratory where they are measured for Radon. If the tests show a Radon level above the action level, the levels can be reduced in various ways. These range from installing a radon sump system at a cost of about £800 to sealing cracks and gaps. The solution required will depend on the type of building and the radon level. You can get more ideas on how to reduce radon levels here. It is standard practice amongst surveyors to warn buyers if the property is in an area which may be affected by radon. If you are considering selling a property in an affected area, you should consider having the radon test carried out and making the result available to the buyer on request. If you are buying a house which may be affected and has not been tested, you should consider negotiating a “retention” from the purchase price with the seller. An agreed sum (say £1000) is kept back on completion and held by the buyer’s solicitor or their mortgage lender. The buyer then arranges for the test to be carried out and completed within six months of completion. If the test shows there is no problem, the retention is paid to the seller. If the result shows the action level has been exceeded, the buyer has a further period of six months to carry out the relevant reduction work. The cost is paid from the retention and the balance is paid to the seller. This information is only intended as an introduction to radon gas. Further information is available from Public Health England.